4 Great Reasons to Join a Mastermind Group. Your ability to connect with a dynamic mastermind group will contribute more to your success than any other business or management intervention in 2018. Hill recalled the scene at another famous mastermind. A farmer was out inspecting his stock in a Model T when he came upon five men stuck in a car in the mud. After towing them out of the muck one of the men enthusiastically shook the farmers hand and proudly proclaimed that ‘I made the car you are driving in.’ ‘And I’m the man who made those tires’ added another in the group. And pointing at two others he said ‘meet the man who invented the light bulb and the President of the United States.’ When the fifth man asked the farmer if he recognised who he was the farmer replied, ‘No, but if you’re the same kind of liar as these other darn fools, I wouldn’t be surprised if you said you was Santa Claus. The Vagabonds on camp. 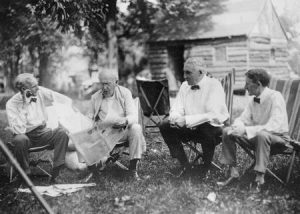 Henry Ford, Thomas Edison, Warren G. Harding, Harvey Firestone. In a world before Facebook or Instagram the farmer could be forgiven for not recognising the marooned galacticos. He had inadvertently stumbled upon one of the most powerful masterminds on the planet. They included Henry Ford, Harvey Firestone, Warren G. Harding (President of US), Thomas Edison and Luther Burbank. They had a formal mastermind called ‘The Vagabonds’ and would take off on camping trips where they would debate science, politics, business and philosophy. Roll forward to 2011 and I encountered the inherent power of a mastermind at first hand. It was in the throes of the worst recession to beset the economy in living memory. The business strategies that had once worked so swimmingly for my clients just weren’t cutting the mustard any more. My clients businesses were under pressure and needless to say so was mine. In desperation I convened a meeting of a dozen of my clients and so began the humble and unplanned beginnings of a mastermind group called SMÁCHT. Over a four year period 300 entrepreneurs would participate in a series of SMÁCHT Mastermind Alliances and I’m very proud to relate that all are still in business. Many are thriving and some have gone on to build businesses of real significance. In his book ‘The One Minute Millionaire’ Robert Allen described leverage as equaling speed in business. If you want to grow your business by 10% yearly you can achieve this absolutely by hard work alone. But if you choose to double, triple or quadruple your business performance and results you will need to apply the principle of leverage to your business efforts. Allen suggests that there are six forms of business leverage. It provides sterling economic leverage. This ‘third mind’ has been variously referred to as intuition, universal intelligence, the super-conscious mind or God. Call it what you will, suffice it to say that it exists and is as real as the nose on your face, and it abounds prolifically in the haven of a well managed mastermind. When harnessed correctly this power….. Provides breakthrough ideas infinitely different from the norm. Solves complex and seemingly impossible problems easily and immediately. Creates serendipitous connections between you and other people who can help you. It just happens. There is a dynamic in a group that is exponentially more powerful than working solo or in isolation. All the great artists, composers and entrepreneurs understand the almost supernatural power of a mastermind. In Conamara there’s an expression that says ‘aithníonn ciaróg ciaróg eile’ which literally translated means ‘one beetle recognises another beetle’ or ‘birds of a feather flock together.’ The same applies in life. One of the most successful masterminds in the world has accountability at its very core. Have you ever considered how Weight Watchers are so successful in helping people lose weight? They bring people with like goals together in a group. (Motivation). They provide them with information on the components of weight loss. (Education). They agree weight-loss goals with them. (Goal setting). They weigh them weekly and give them appropriate feedback. (Accountability). Then they help them establish healthy and enjoyable eating routines so that healthy eating becomes a habit and is not a function of discipline or will power. At that seminal meeting of SMÁCHT on February 8th 2011 we spent considerable time debating what was the quality most needed to survive the recession. The conclusion was that it was discipline. It was felt that with discipline and will-power one could achieve virtually anything. There were a few issues with discipline however. For one, people didn’t like the sound of the word so I changed it to its Irish equivalent which is SMÁCHT (pronounced SMOCHT). Of more fundamental concern though was the endurance of discipline. Over the next few months we began to apply discipline to our business with limited success. It would work for awhile but then we’d revert to our former behaviour and and habits. We then stumbled across a body of research that would have a massive impact on our mastermind. Stanford University professor, Baba Shiv, revealed just how elusive willpower as a resource is in a study with 165 undergraduate students. He had them memorise two numbers – one group a two-digit number and the other a seven-digit number. Both tasks were well within the intellectual capacity of each student and they were afforded as much time as required. On their way to another room to recall the number, they passed a large table laden down with chocolate and fruit. The fascinating discovery was that the students who had recalled the seven-digit number were twice as likely to choose the chocolate. How then do we build willpower into our businesses and lives so it doesn’t become ‘won’t-power! The trick to enhanced discipline is not to exhaust your willpower but rather make it habitual or automatic so that it’s not necessary to have to even think about it. The key to effortless discipline is routine. The prolific writer Somerset Maugham was once asked if he only wrote when he was inspired. ‘I only ever write when I am inspired’ he retorted. ‘Fortunately that’s at 9am sharp every morning.’ That’s routine. The most successful change organisations in existence understand the power of changing routines in order to change results that at one point seemed almost impossible. Take Alcoholics Anonymous for example. They can conservatively boast of helping at least 10 million people achieve sobriety. They do it not by addressing the psychiatric or biochemical issues of their members but rather through helping them change their routines around drinking. Weight Watchers do it for food. By creating a few simple routines of measurement they can dramatically impact a persons weight. The Rule of Benedict is almost 1500 years old and yet continues to enable contemplative monks to run businesses of great profitability and wealth by working only four hours a day. The Rule is essentially a series of routines incorporating a balance of prayer, work, rest, study, chanting, education and learning. The message is simple. In order to change your results change your routines. How to Run a Successful Mastermind? Franklins description in his autobiography, although almost 300 years old, still contains invaluable advice on how to set up a mastermind and how to run it effectively. ‘….. I formed most of my ingenious acquaintances into a club of mutual improvement, which we called the Junto. We met on Friday evenings. 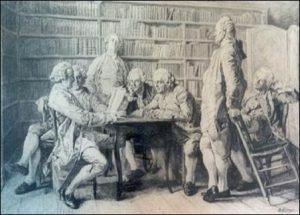 The rules that I drew up required that every member, in his turn, should produce ….. points on morals, politics, or natural philosophy, to be discussed by the company; and once in three months produce and read an essay of his own writing, on any subject he pleased. For Franklin, keeping the Junto from developing into rancorous debate was of the utmost importance. To this end he employed a gentle Socratic method during discussions, drawing the opinions out of members with questions couched in curiosity as opposed to attack. The rules dictated that those who were contentious were charged small fines. In summary, Jim Rohn said that ‘you are the average of the five people you are surrounded by most.’ The ultimate way for you to leverage your business results in 2018 is through the power of a mastermind alliance. It will clarify where you want go; where you are now; and keep you accountable and motivated to achieve your goals. There is no better performance management system for entrepreneurs than a dynamic mastermind alliance. If you are interested in joining a serious new SMÁCHT mastermind for entrepreneurs I am beginning one in Galway on January 23rd 2018. Please call me on 087-2647817 or email me on p@omaille.ie to discuss how it might benefit you.